Please check the low-tide time before you make a plan. Start shellfish gathering 1hour before the low tide. Local fishermen are granted fishing right to shells. So, we have to pay for gathering and can not get shells out of the specific area. 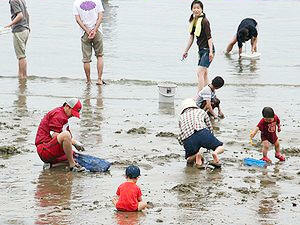 The best time is about around Ise Bay and Mikawa Bay, and may vary slightly from beach to beach even in the same bay. Take care! 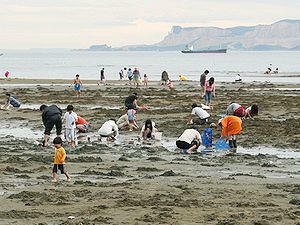 In some beaches, shellfish gathering is prohibited. Official Shiohigari calendar of Mihama-cho is here. Walk to the northwest 15 min. Meitetsu　Kowa Line. Take Chita Bus. Get off at Kanigawabashi (蟹川橋)stop. Morozaki-ko. Get off at Tobigazaki stop. Morozaki-ko. Get off at Yamada stop. Kowa Line. Walk 1 min. Futto (布土) on the Meitetsu Kowa Line. 0569-82-1111 Get off at Kowaguchi (河和口)Sta. on the Meitetsu Kowa Line. Kowa Line. Take Chita Bus. Get off at Yanashi stop. Just a hop. 0569-82-1111 Get off at Chita-Okuda (上野間）Sta. on the　Meitetsu Chitashinsen Line. Meitetsu Nishio Line. Take taxi 15 min. harbor. Get on boat for Sakushima 30min. JR Tokaido or Meitetsu Gamagori Line. Child:600yen/2.5kg 0533-68-5131 Get off Mikawa-Miya Sta. on the JR Line. 0533-68-5131 Get off Mikawa-Miya Sta. on the JR Line. JR Line. Walk 3 min. Meitetsu Nishio Line. Take taxi. 10 min. Meitetsu Nishio Line. Walk 10 min. Meitetsu Gamagori Line. Walk 5 min.